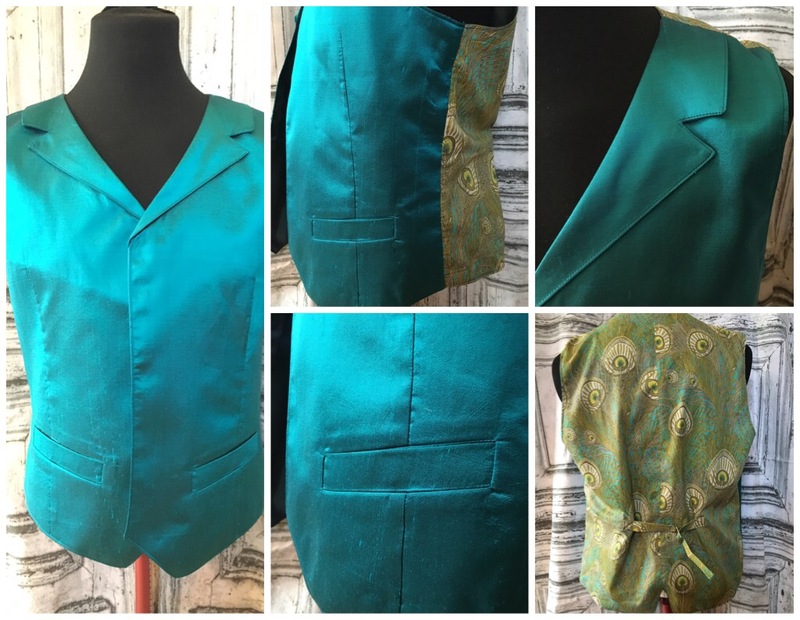 Four weeks before the wedding, I went through my waistcoat patterns (can you believe I have FIVE!!!) and chose Simplicity 2741. I chose this one because it didn’t have a collar, was fully lined and had some nice shaping at the front & back. The welts are fake too. I wasn’t scrimping my friend, honestly! I wanted to make it out of really nice fabric so didn’t want any tricky manoeuvres to scupper me along the way. So, one rainy afternoon, I decided to make a first draft. I made it wearable, out of denim and a bit of left over shirting. 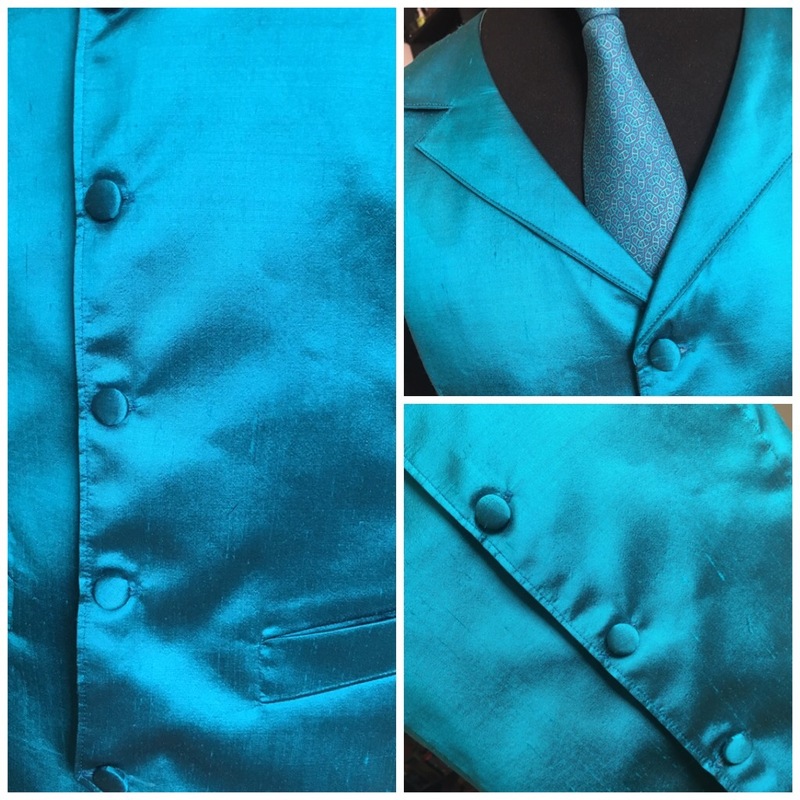 I made it using the grooms chest and waist measurements and (apart from buttons) finished it off fully… If it doesn’t fit him, it’ll fit me! For speed, I didn’t line it. I zigzagged the edges, folded the 1.5cm seam allowance and topstiched. Pinch 2cm (1 each side) from the neck tapering to nothing at the shoulder, to accommodate non sloping shoulders. Shorten the Buckle carrying section of the ‘tie back’ by 3cm. Mine was blue linen and the shirt, a nice soft cotton (also from Ditto). 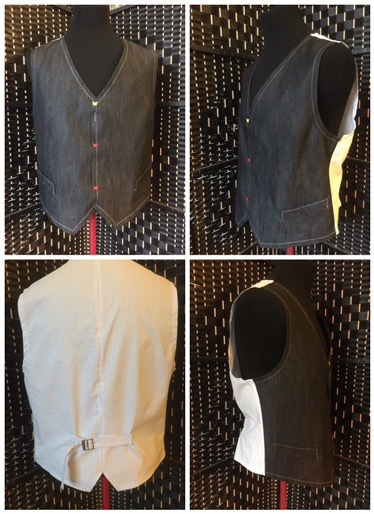 I did the welt pockets on his waistcoat on the bias as they went over a dart. 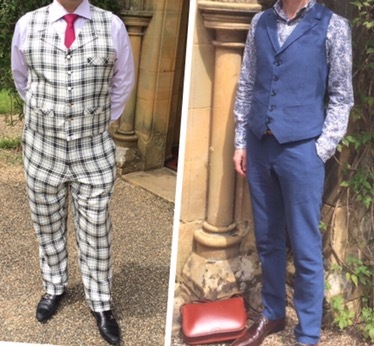 The waistcoats are a mash-up between simplicity 2741 and burda 7799. MrA’s trousers are lengthened from the burda magazine shorts I made HERE. My trousers are a new cut (went down a size- successfully!) on Thread Theory Jededdiah Pants. After my recent success with Crayola ultra washable pens (on my PIN-TUCK SHIRT) I used the grey one to mark MrA’s notched collar/ welts etc. I sent them to the dry cleaners as I was afraid of the interfacing coming away in the washing machine. Sadly, dry cleaning was no match for my grey pen, and a second go by the cleaners even turned some of the marks an interesting shade of orange. The same happened to my shirt. I put the shirt in the wash (30°) and the pen came clean out. Lesson learnt: only use the pens on machine washable garments, otherwise; chalk. Humph! Anyway, back on with the Grooms waistcoat. His surname is Romanian for Peacock. 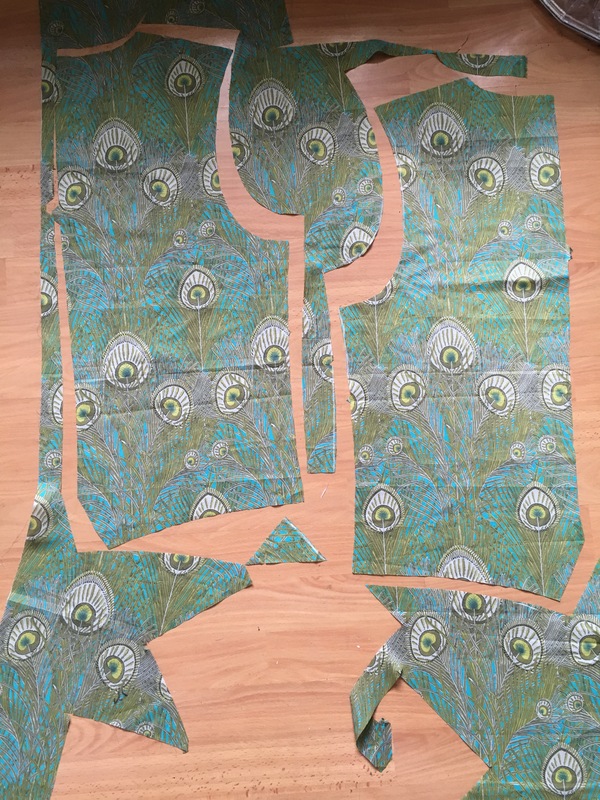 So, inspired by our WEDDING WAISTCOATS, MrPeacock wanted a patterned back and a plain silk front. This was the perfect time to use the Liberty lawn ‘scrap’ (ha!) I had left from our WEDDING QUILT. Just enough for the back, but no room for pattern matching. 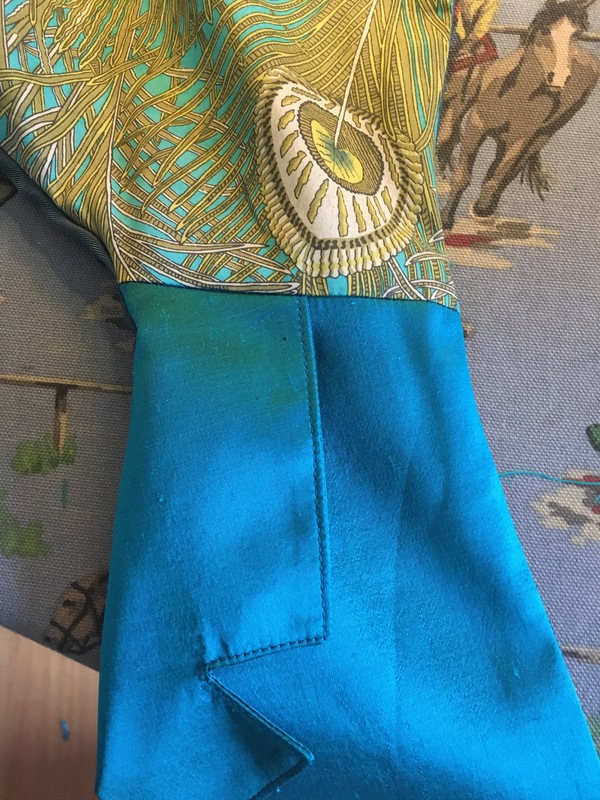 The assistant in Maculloch and Wallis was really helpful and I got some Dupion Silk in Teal (I ordered it and it arrived in just two days) to match the background colour from the Liberty fabric and I used a dusty grey/ green/ blue lining I had already (from the bottomless fabric haul of LadyP). In Kleins, I picked up a matching silk thread too. Cut outers, linings, pockets, collars & interfacing. Interface fronts, welts, 1 of each collar. Sew front darts, lining & outer. Press to front. Make collar, clip, turn, topstitch. Baste to fronts. Attach welts and pocket facing. Clip, turn through & press. Attach pocket bags to bottom welt & facing. Sew ‘triangles’ down. Sew up sides. 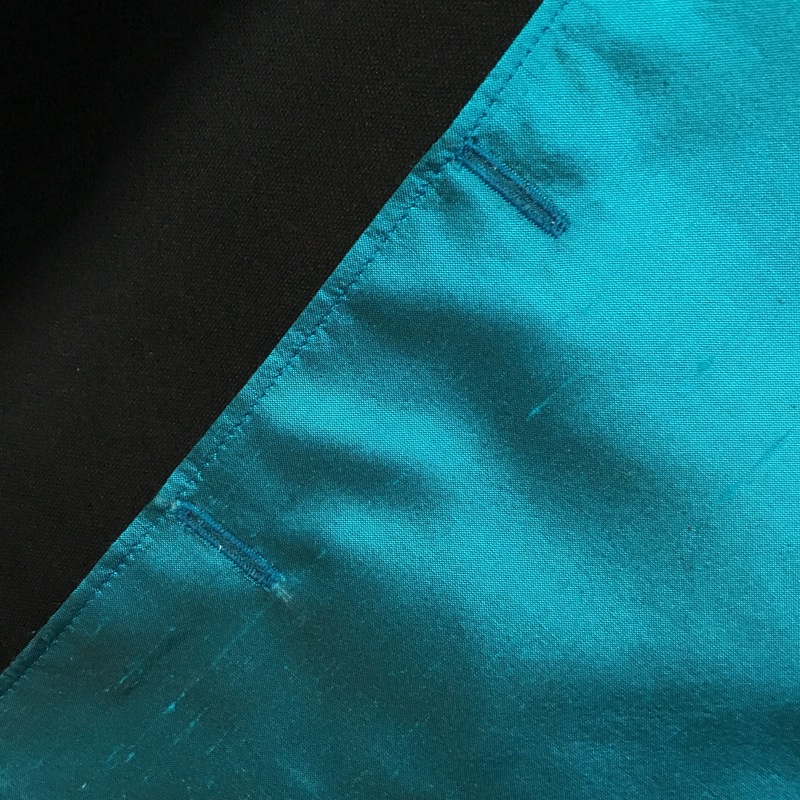 Sew backs together, outer then lining. Press seams open. Make back ties, position & sew to back. Sew on buckle. 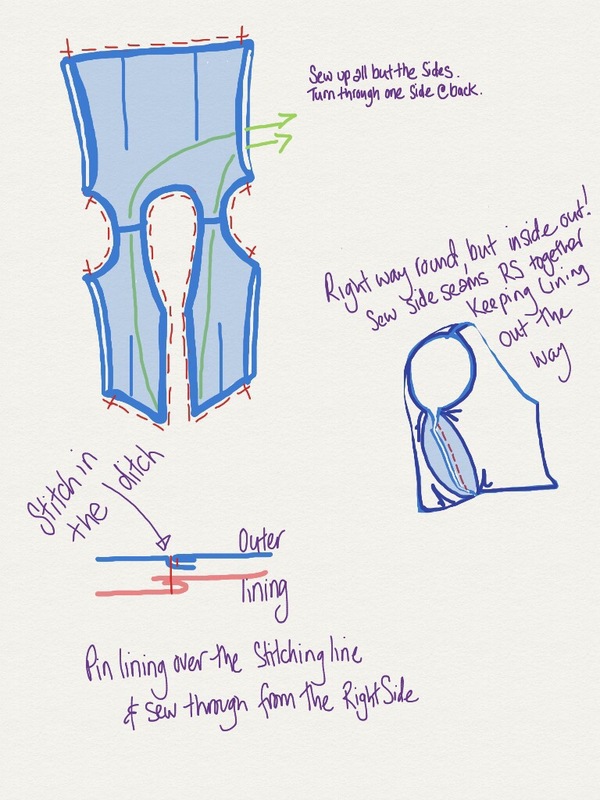 Sew together at shoulder seams, outer then lining. Press seams open. Topstitch from under the collar, all the way around to under the collar on the other side. 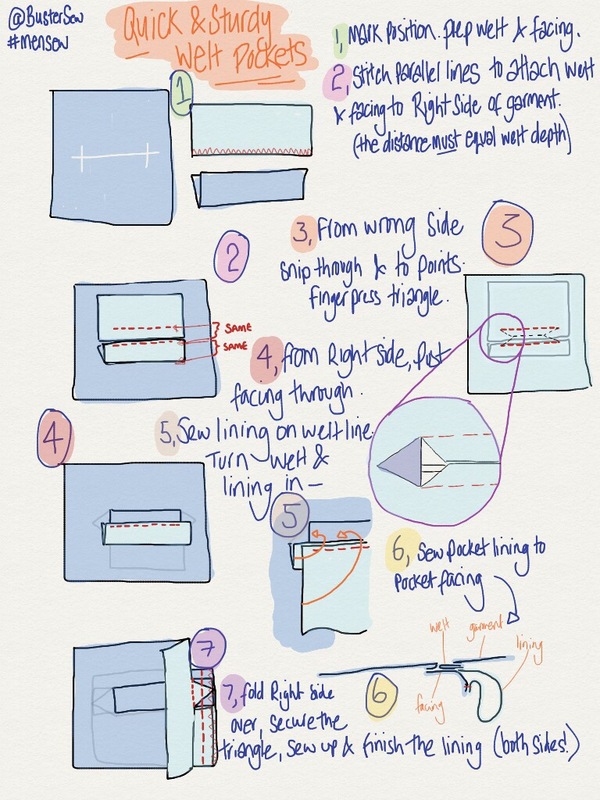 Mark & sew the buttonholes. Cover 5 buttons (I got the easy snap metal type from Kleins). Mark & sew the buttons on. The tie is old & borrowed. The waistcoat is new & blue. Now all I have to do is look forward to the wedding at the weekend! The more expensive the fabric, the nicer it is to sew with. Fact! Haha! Silk thread is nice to sew with too! Don’t exclude ‘extras’ in fear of mucking them up: practice them. Always make sure you have enough buttons before starting a project. Only use chalk to mark dry-clean garments. Add a disappearing purple ink pen to your marking arsenal for light colored fabrics. They mark dark purple but disappear within a few days. If you need faster results, wet with a cotton swab and iron. I made white poly Greek Goddess costumes for a musical, and I made so many purple pen marks the dancers thought they were going to be purple, but two days later they were back to pristine white. For dark fabrics I like to use a Chaco Liner. I recently discovered (through an Instagram user) how nice it is to have some Frixion pens. Their ink disappears when heated. 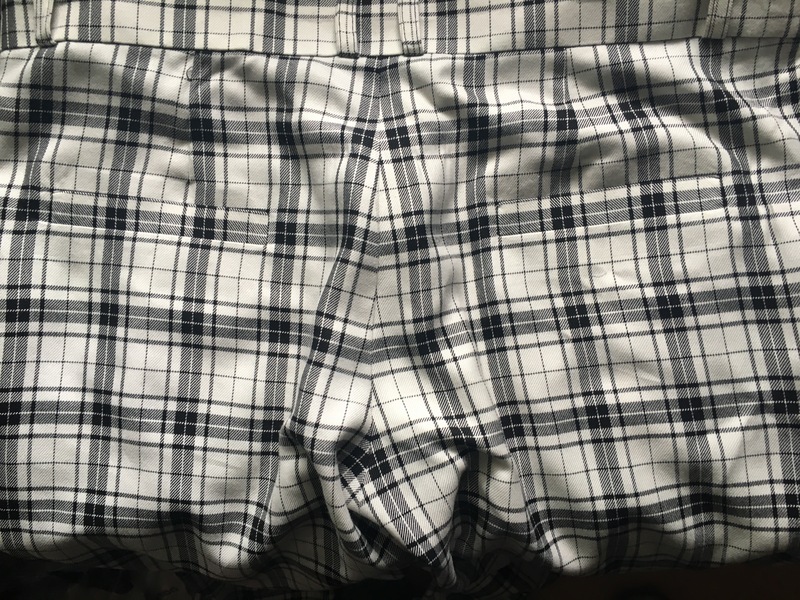 On all fabrics I’ve tried them on, they leave no residue. And they can make really sharp marks. Doesn’t work on everything, but it’s a good tool to have in the box. I know what you mean. Without looking, I know I have at least 5 pencils, 3 water soluble velt pens, 6 Frixion pens, 3 different colours tailor’s chalk, one other chalk, a chalk wheel, a refillable chalk pen and a tracing wheel. There are probably more in my junk drawer. Haha! You’re worse than me! Very dapper indeed! Love the black and white tartan too.. It is a nightmare to match sometimes but well worth the effort. Haha, I think it’s more obsession than discipline to be honest! I’ve taken to writing them up as I go along, when it’s too late to run the machine, I have 3 half written at the moment! It’s a relatively new obsession, maybe I’ll settle down soon, but I love the outlet if gives me to ramble on! And lovely comments & encouragement like yours make it even more enjoyable 👍🙏. I wanted to join Jamie’s challenge, but to be honest, I’m a bit (a lot!) daunted by all the hand stitching! … Maybe I’ll make a blazer of 2017 ! ?… I’ve got a couple of dresses to get on with next, half finished, like their blogs! I daren’t count my ‘to do’ list never mind the ‘half finished’ list. If I don’t get my blogs written up soon my phone memory will be packed to the rafters with photos!